Should You Save for Your Retirement or Your Kids' College? The price of college is seemingly increasing by the year, which worries many parents ( myself included) who don’t want their kids to have to deal with huge student loan burdens. If you have trouble saving for your child´s preferred college, don´t worry about it, tell them to check out some of these Cheapest Online Colleges that have been proven to have a high percentage of graduated students. The average cost for a year of undergrad is currently anywhere between $20,000 and $50,000 depending on whether the school is private or public. If you want to save money to send your child to college debt-free, that’s very commendable. But, you’re going to have to consider other major costs in your life as well, like retirement. When it comes to saving for retirement or college, I’ll always stand firmly in the retirement camp. As someone who’s dealt with student loan debt and paid it off, I wouldn’t wish it on my son at all. I know how it can slow down your financial and life progress. However, I survived just fine and I know others will too. Getting into student loan debt was actually one of the best things that happened to me in a weird way, because it allowed me to start my blog and skyrocket my career. Aside from that, it’s important to realize that while you can take out loans for college, you can’t take out a loan for retirement. If you’re ready to stop working or can no longer work due to health reasons, you’re going to be out of luck if you don’t have any money stashed away to retire with. At that point, you certainly won’t want to deal with debt, personal loans, and credit cards nor your children just to get by. I don’t want to be a burden on my son when he gets older, so while I may not be able to give him a full ride to college, I plan on being self-sufficient enough to help in other areas and to financially support myself. Compound interest is a powerful tool for your finances because it helps your money grow and start to work for you. Compound interest is the addition of interest to the principal sum of a loan or deposit. It’s also referred to as ‘interest on interest’. It occurs when the interest the accrues to an amount of money actually turns into interest itself making the balance grow, sometimes significantly. One of the best things about saving for retirement is starting early and allowing compound interest to help grow your balance significantly. For example, let’s say you contribute $10,000 one year and your earnings grow at an average of 6% each year. You continue to invest around $500 per month and plan to retire in 35 years. At the end of those 35 years, you’ll have $797,152.44 saved up. $220,000 of that was a direct contribution (10,000 + 6,000 x 35), while $577,152.44 was due to growth. That’s a ton of growth and security you could miss out on if you focus on if you choose to stash away money for college instead during your prime earning years. If you start taking saving for retirement seriously when you’re 45, your accounts will never experience as much growth as someone who started at 25 or 30. That’s time you can’t get back. If you don’t plan on working well into your 60s and 70s, you definitely want to focus on building up your nest egg first, then contributing to a college savings fund if you can. When I was in college I worked a job and took care of my son as a single mom, so I have pretty much no tolerance for young adults who are physically capable of working during college but don’t. I can understand that it may be tough if your child is in an intensive program. But, most students can juggle a job in college along with their coursework. This can help soften the financial blow of tuition and other expenses. You can also consider scholarships and grants based on what your son or daughter qualifies for. Most people underestimate scholarships and I don’t understand why. I applied for and earned two scholarships during college and I wish I would have been more serious about it so I could have received more funding. 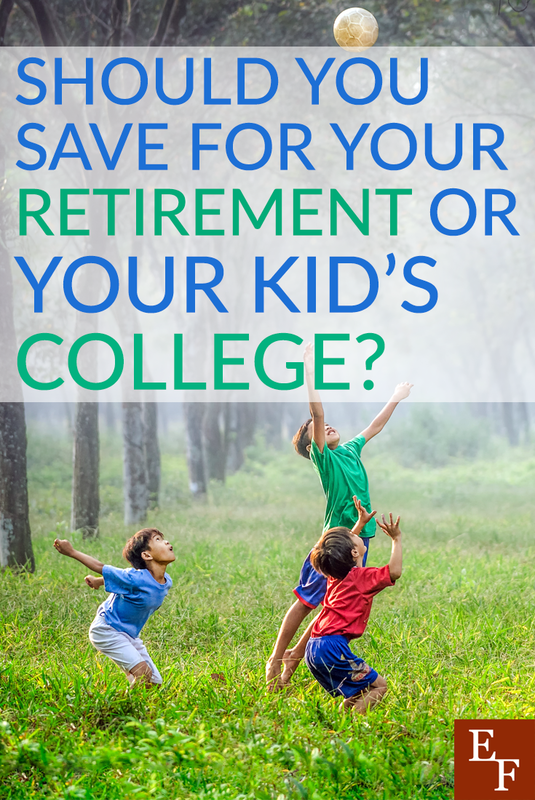 It’s important to set expectations for your child years in advance so you can both work out a plan to help pay for college and still save for retirement. Realize that while there are plenty of options to make college more affordable, there is only one when it comes to your retirement. You must save and invest if you want to build wealth. That’s the bottom line. This is why you should focus on setting yourself up for financial success in the future before you’re able to do this for your kids. It’s similar to the disclosure they give out in the airplane about putting your oxygen mask on before you can help your child. You can’t help anyone if you’re unprepared and drowning financially yourself. Once you have your retirement contributions steadily flowing, then consider setting some money aside for college if you can. Are you prioritizing college savings or retirement and why? Have you started to save for your retirement?